Our first night out of the house was spent at a friends Garage Forecourt in Devonport. Mark very kindly said we could stay the weekend but the first two nights away from the house were fantastic and with the remnants of a cylcone bearing down on us, it was nice to half tucked under his forecourt verandah. We met our regular Friday night friends Alan, Grant and Robyn, just around the corner at a Bar and enjoyed some good nerve settling banter with them before joining them for a great Italian meal up by the Victoria Theatre in Devonport. Fantastic night. Waking up early on Saturday, Rafe’s grey tank said it was full (which it wasn’t) so a quick trip was made to the dump station at Albany and we did a complete dump and top up of fresh water so we were right for a few days. Fiona followed me in the car up to the lockup with some last minute leftovers from the Packers like vacuum cleaners and cleaning stuff to squeeze in the door 🙂 .. It is packed to the rafters literally !! 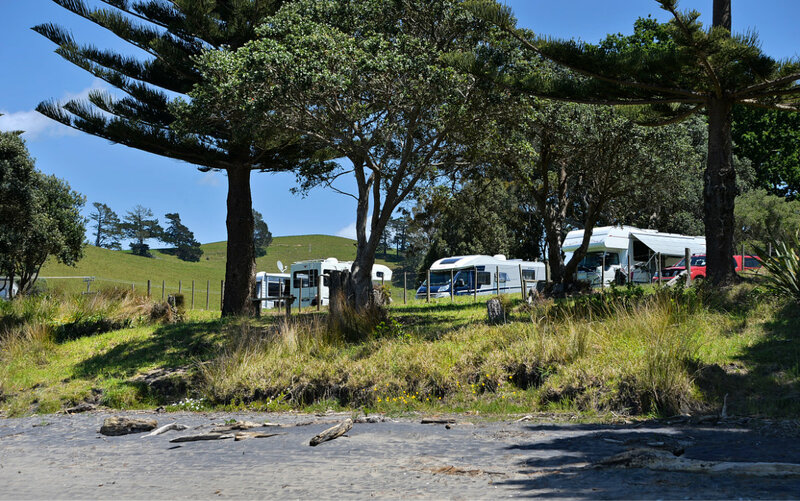 With the weather improving, we headed to Woddall Park in Narrow Neck, a well known freedom camping spot. 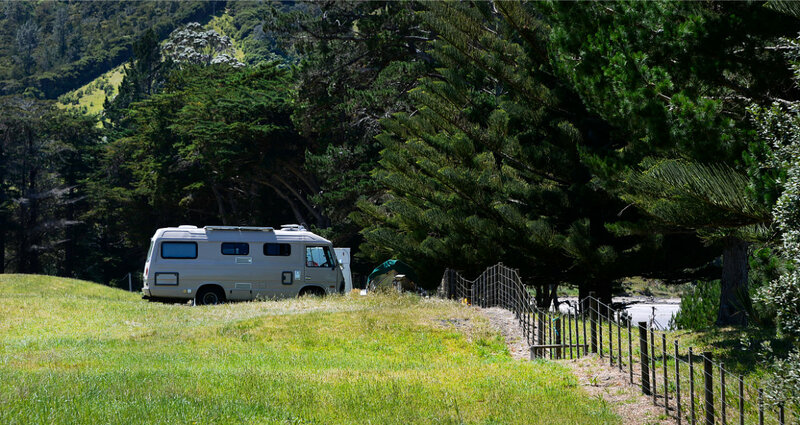 Its interesting as one of the recent less than intelligent moments from our Council was a decision to ban Motorhomes staying at this park without any discussion. The locals however were outraged and promptly got them to reinstate the parking as the presence of Motorhomers meant the hoon element had completely dissapeared. Fan bloody tastic ! .. A classic case of Council plonkers making arbitrary decisions and not listening. My intermediate and High School years were spent not living very far from this beach so I know it pretty well. Fiona lived on the beachfront reserve for a few years as it was Army housing as her dad was CO of Fort Cautley, so she was really familiar with it too. A lovely spot. 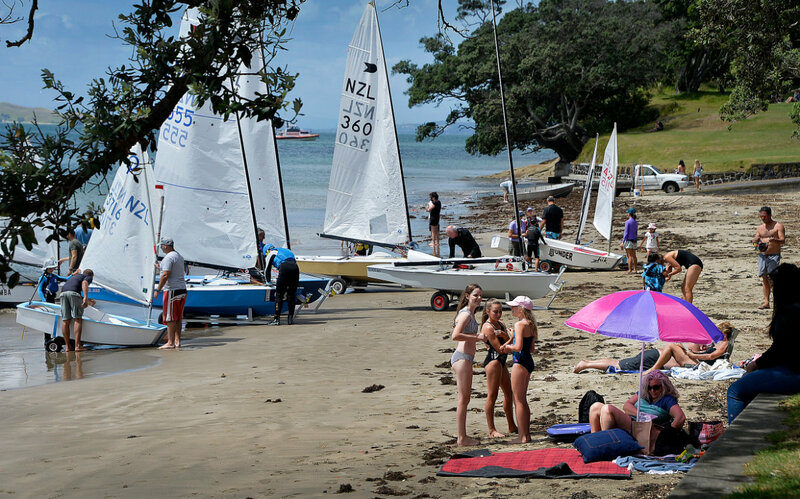 The day we were there, there was a big day for small yacht racing out on the beach. Its neat to watch the Dads all pitching in helping their kids rig their yachts and set them off racing. Lovely to see them having a cuppa at the club house and waiting on the beach and helping them in too afterwards. 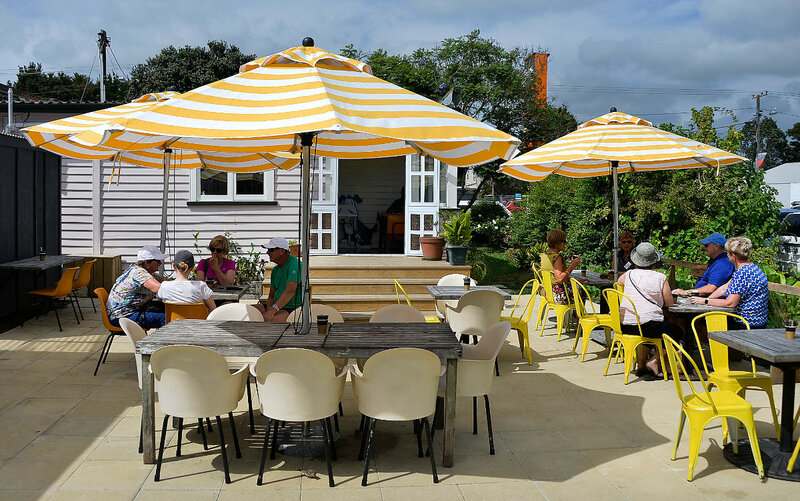 The pictures tell the story really but a fabulous spot for a night and great walks from here to Cheltenham and most of the way to Takapuna too. 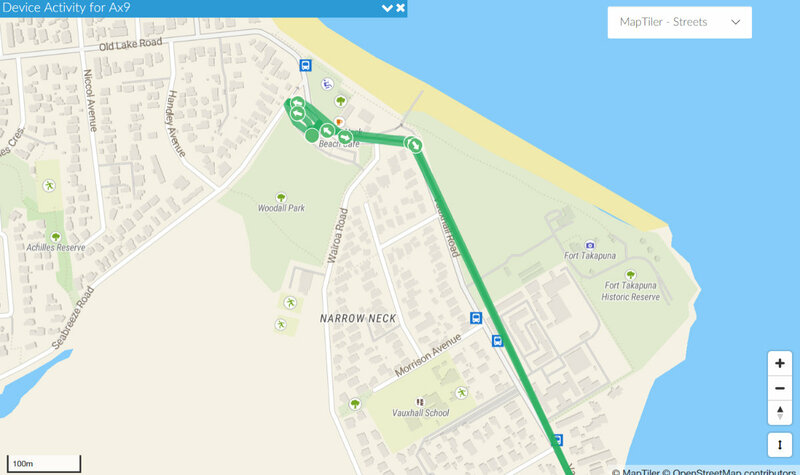 There is also a bus stop to the ferry or to Takapuna right next to the park. We’ve been to quite a few Mission Concerts now and they never seem to fail to entertain. 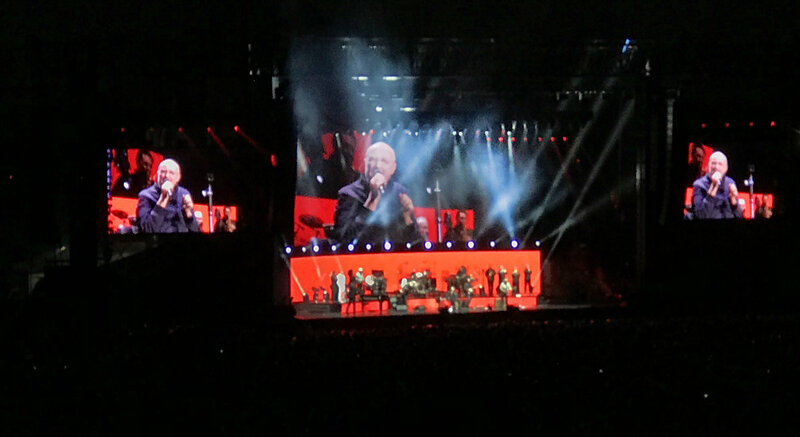 This year, we had Phil Collins along with a couple of local bands which warmed up the crowd. The day started with breakfast at the Taradale Club which was supposed to include a shuttle ride around to the venue too but when the time cam for the shuttle, the driver went AWOL 🙂 so we walked and it wasn’t far and it was fun. Breakfast was great and at $10 each was very good value. By the time we had finished breakfast, it was pretty much lunchtime so at 2pm, after a bit of a snack, we headed off around the corner to the Mission Estate. 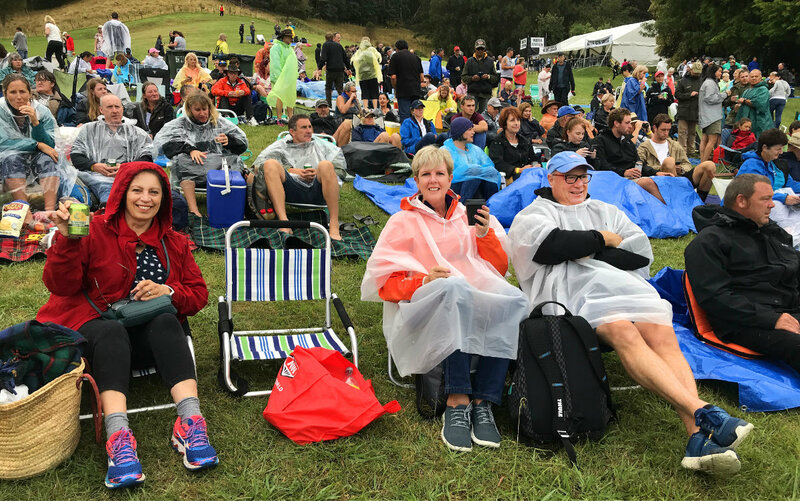 Fiona, Dianne and Gary all rugged up. The weather was supposed to shower in the morning and improve as the day went on but the weather was late.. so the showering happened during the early bands. By the time Phil came on, everyone was damp, it was cold but it had pretty much stopped drizzling so as the night went on, we dried out and it was quite pleasant. 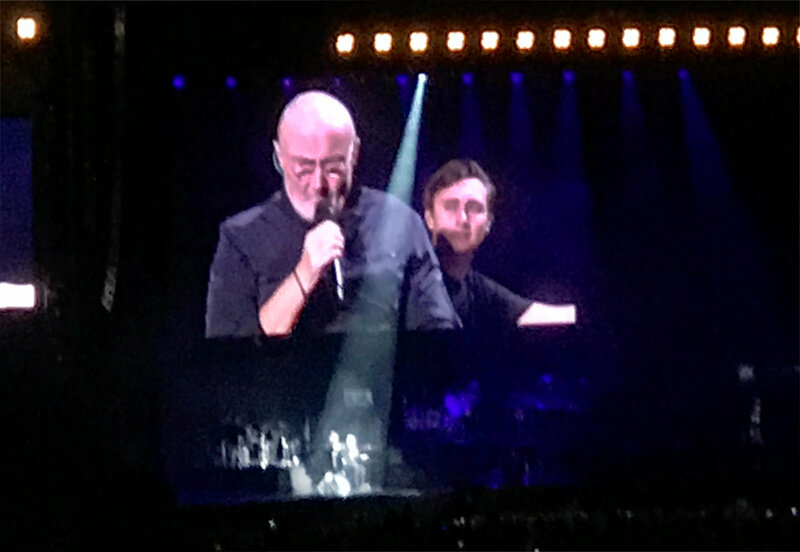 Phil had had some back surgery and had a duff leg so was aided by a walking stick and sat on a stool at the front of the stage but as a drummer, he is very used to singing sitting down and it sounded as good as it ever does. His 17 year old son Nicholas is now the drummer and is very very good. One of the early songs they played had a huge quite complicated drum solo in it and he did a great job. He’s also a good piano player as well and you could tell that Dad was very proud of him. All in all a great concert which I’m pleased we went to despite the timeing with packing our house with moving just a week or so away. A good trip..
We headed back to Auckland after a nice night at the NZMCA park at Taupo. 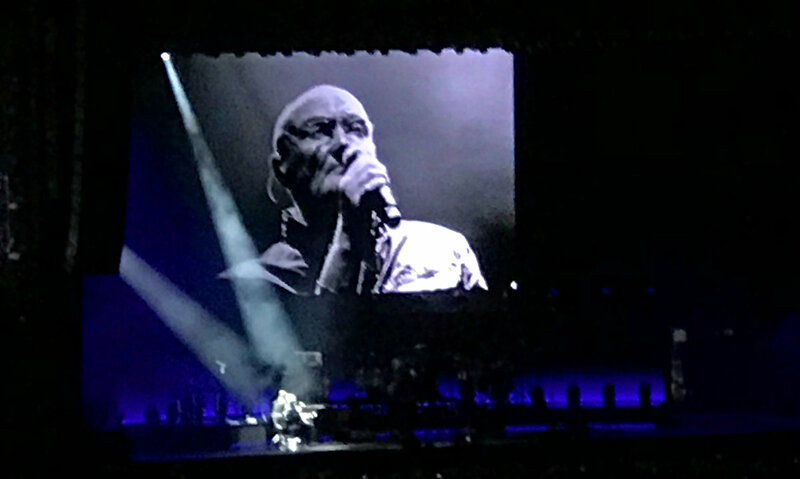 Late last year, I received an email from our Taupo Motorhome friends Gary and Dianne asking if we wanted to go to the Phil Collins concert.. yes please says I so Gary bought them online. I’m not sure exactly where he was at the time but I suspect it was somewhere in the UK. 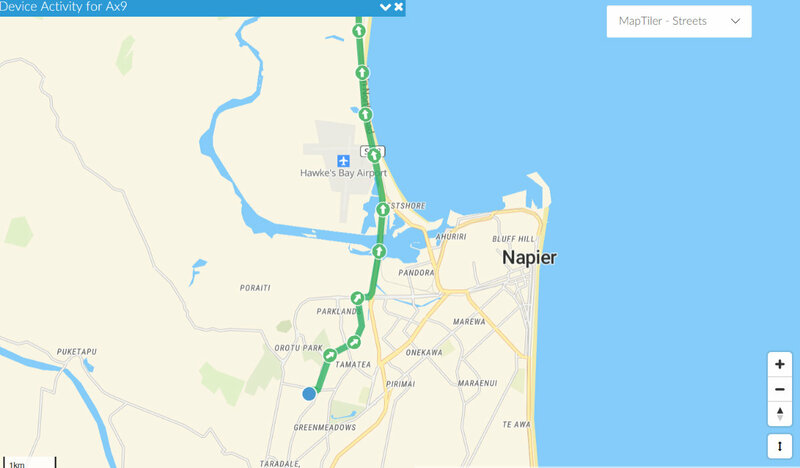 All I had to do was arrange for some parking at Napier for our two Motorhomes. 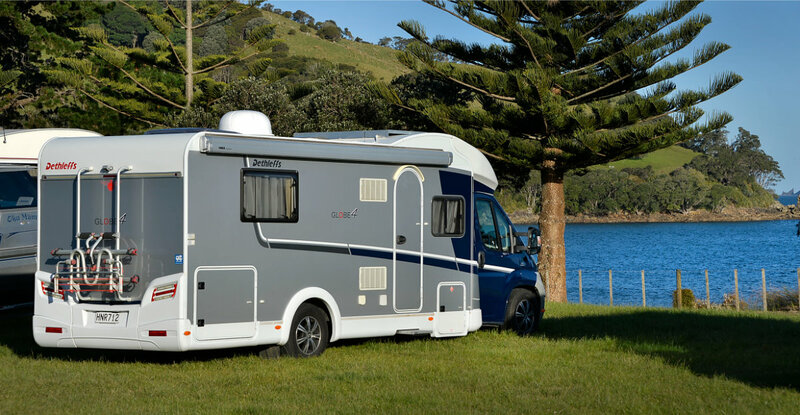 Just as that was happening, I received a very timely email from mary at the Taradale club saying they had limited Motorhome parking for $25 a night.. thats us I thought so I immediately booked us for two nights for both of us. Fast forward 6 months or so and despite moving out of our house in less than two weeks, we’re on our way for a few days to Napier. Arriving at Taradale, I met Mary who was happy to change Gary and Dianne’s park so they were next to us and not long after we arrived, in rocked Gary and Dianne in the Niesmann. 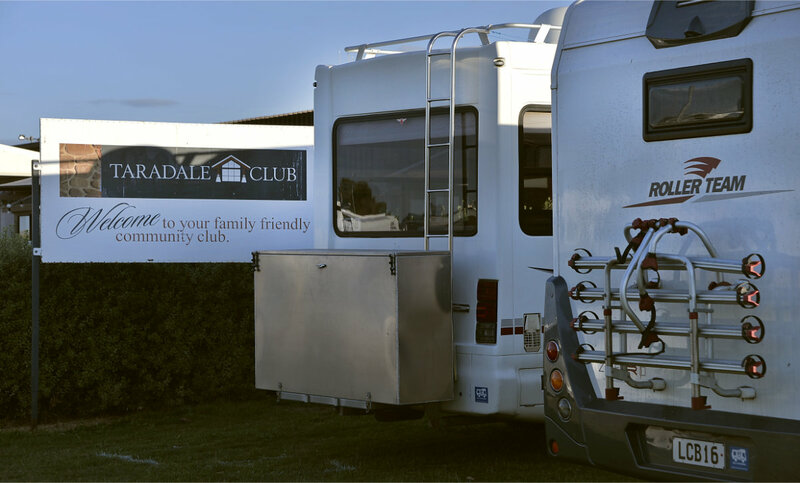 The Taradale club was doing a BBQ tea for $20 a head and a $10 cooked breakfast so we clocked oursleves in for those too! Every nook and Cranny was used. The parking was great and with the temperatures hovering around the early 30’s it was stinking hot. The club’s bar with its air conditioning was a great spot to hang out and the drinks were reasonably priced too. It was one of these ! 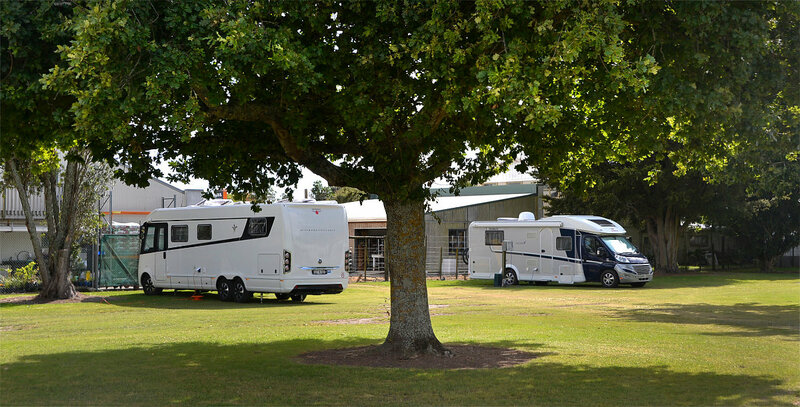 There were probably about 30 odd Motorhomes there with most taking up the option for the meal and the breakfast. Everyone was happy to chat to each other in the parking area and it was a very friendly spot. Over the road, The NZMCA had leased a paddock fromn a local farmer and there was parking there too and that would have helped that Clubs turnover too! Mary did a gfreat job making sure everyone was where they wanted to be and organising the meals. A neat spot to stay and very close to the concert venue as well. Rafe’s Tracking map north showing where the club is. We were heading up North for the weekend to catch up with Helen, Chloe and Jessica and also meet Gary and Dianne from Taupo. 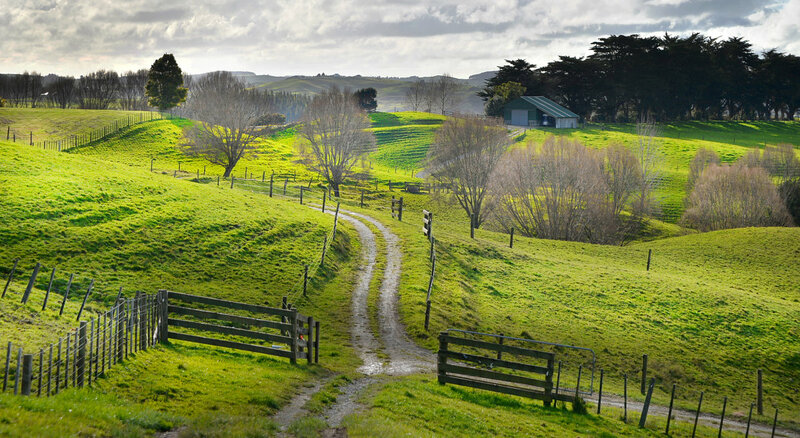 The plan was to meet Gary and Dianne at the Caledonian Park at Waipu for a night and then go on up North after that. We pulled into the park early in the afternoon and it was good to see a few others in there enjoying the park. There were several Caravans and a couple of Buses there. What wasn’t so good to see was the missing buidings from the recent fire. As Gary said later, it was like a Tooth was missing. The fire happened in late September and burnt 3 shops to the ground including Fiona’s favorite cafe which is temporarily trading in a building over the road. 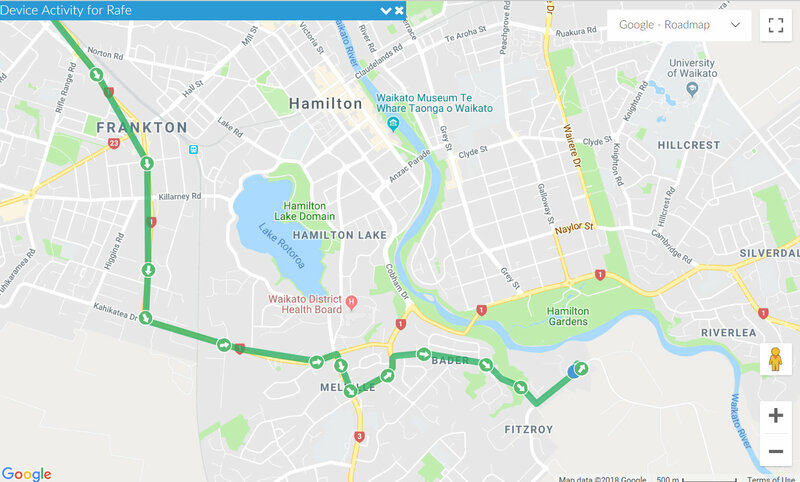 Having something like this happen in a small town like Waipu would be devastating and I’m sure was a real shock to the town. That Gap from across the road. The town rallied around to help those businesses and many worked through their Christmas Holidays to help get some temprorary accomodation for the Cafe. The next morning we went for a look through the town and had a coffee at the Cafe Deli over the road in their temporary building. Good to see some others here. Its good to see they’re rebuilding but what a huge hole. 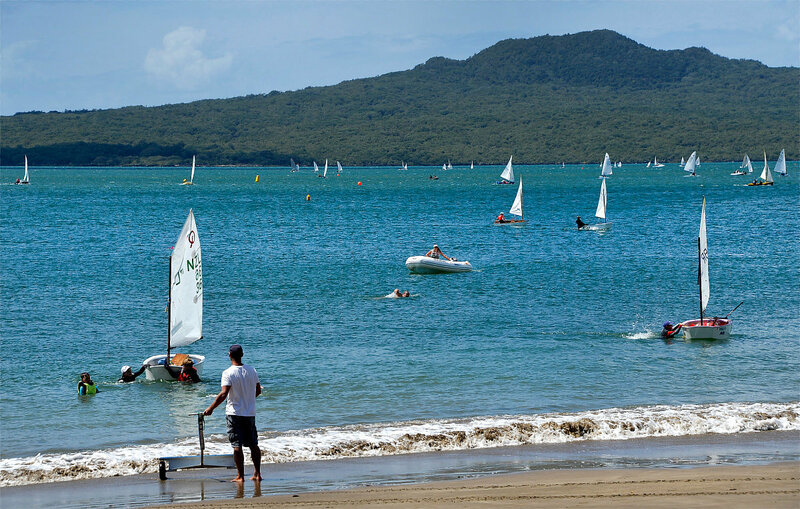 The Bowentown Holiday Park is in one of the best locations with one of the best Beachs ! With a friendly crew and with the NZMCA off season deal of pay for two nights, and get two thrown in, it was just too tempting! Their normal tariff at $23pp powered I thought was very reasonable anyway, given the facilities provided. With Tania’s cheery voice on the phone and confirming there was a space for Rafe, I was underway. On the way, I stopped off at Karangahake Gorge to do the Windows walk. 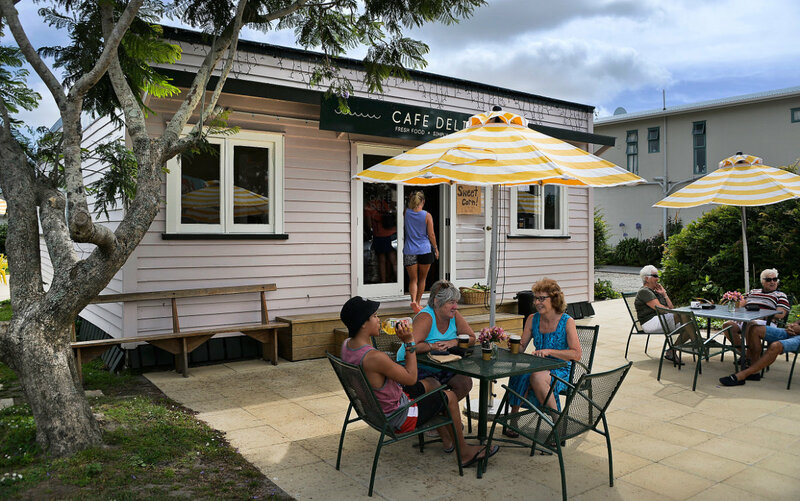 Well worth doing, and after that, I stopped to check out the new NZMCA park at Waihi Beach. Another great addition to the parks network. 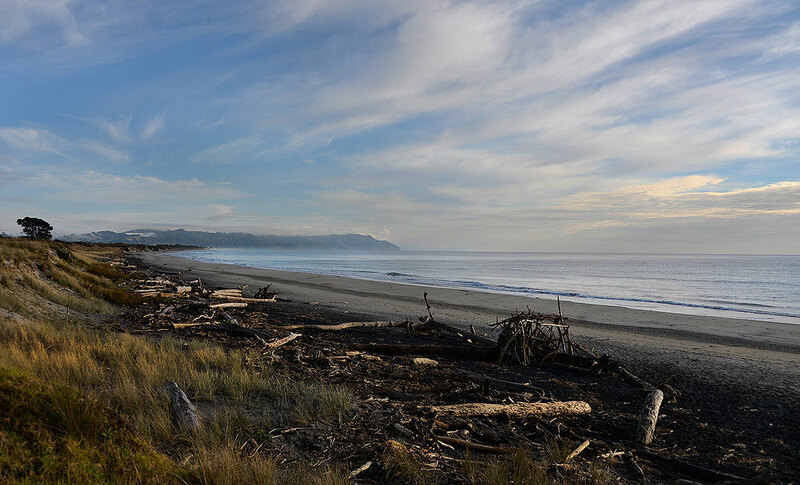 The Bowentown Holiday Park is at the end of a long peninsula right on the beach. It is well setup up with a newish Amenities block with TV room, Games room, huge Kitchen and an amazing space age looking Laundry. There is also a spa pool area there too. I was offered a park right up against the hill overlooking the beach and the rest of the park. It was a breeze getting in and settling Rafe and I was off for a look around and down to the beach. A magic spot. 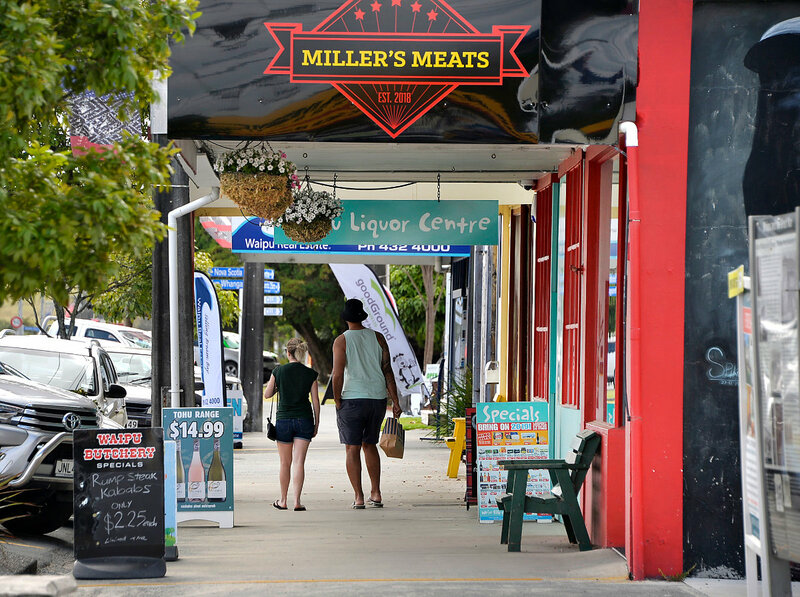 The park has just changed hands after 30 something years, with new owners Mike and Bec settling in and only just 4 weeks in, have already got a plan of attack for new improvements. Two of the cabins are well into a full refurbishment with more to come! The beach here though is the feature of course and being right next to it, it just doesn’t get any better. Even in Winter! A nice park, nice people and I’ll be back soon. A few k’s north of Whitianga is the famous Simpsons Beach. It is one of my all time favorite spots to stay being right on the beach and with pretty much all weather parking on grass and its huge. It has been a while since we’ve been here so I never miss an opportunity. It is $10 per van per night. There is a cassette only dump station which is connected to a Septic tank which I’ve never used but plenty do and there is potable water too. 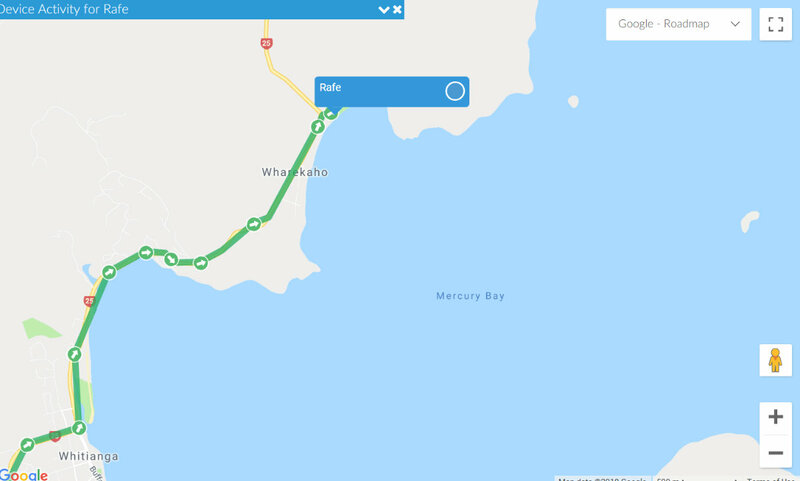 I waited until I went back through Whitianga and used that Dump Station. I rocked up to the “Office” door and Margaret popped her head around the door with the usual smiley face she has. A really nice lady and its amazing that she pretty much runs this now on her own now. All the proceeds from Camping are sent to the Charity of the moment. Last time we were here it was St Johns in Whitianga. 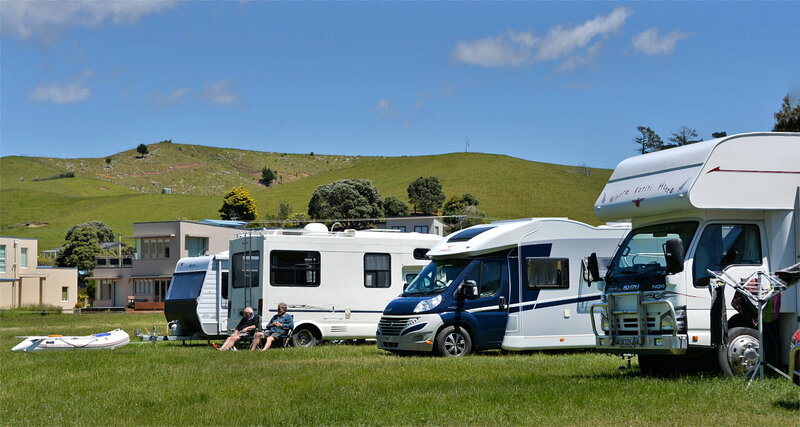 I met Dave and Helen who were in their Caravan from Whangamata who were with their friends who were next to us. Dave is a Self Containment officer so it was really interesting talking to him about Motorhome and Caravan things. 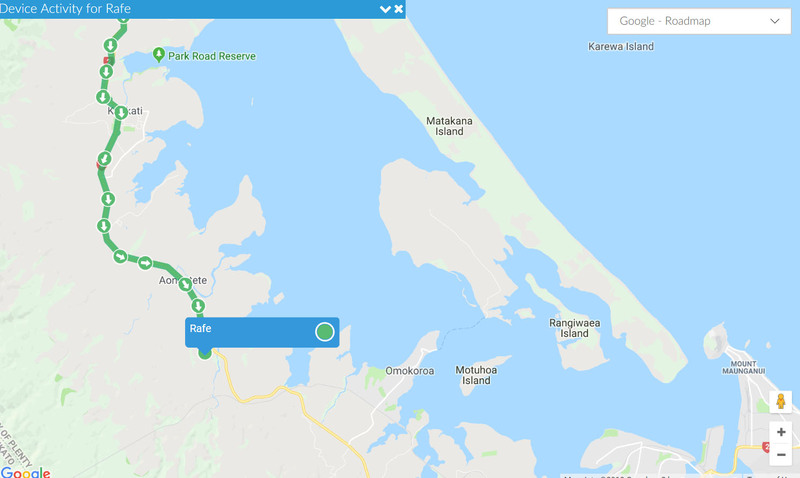 There was also a really nice guy from Nelson staying there called Bim who is travelling around the North Island with his friend in his Motorhome with a boat. With the wind blowing Dogs off Chains that day, neither Dave or Bim were keen to battle the elements out in the bay in their boats. I went for a couple of walks along the beach and got some updated images.. Its a sensational place to stay and its a place you never get sick of. 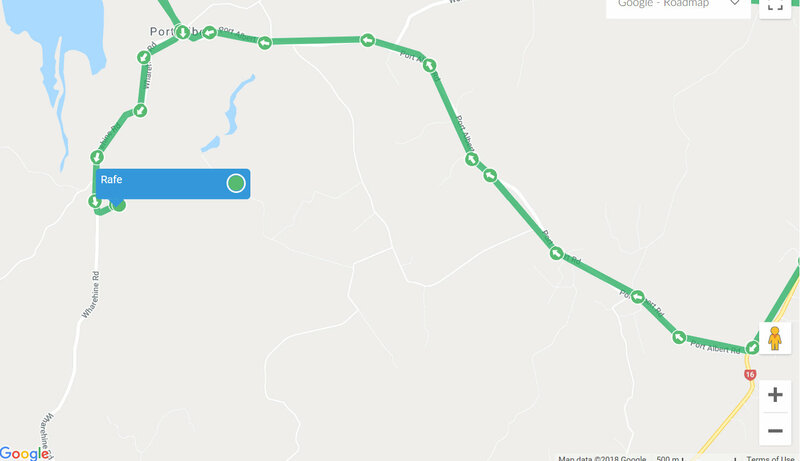 See Rafe’s tracker map below for the location. One of the things I’m really allergic to is parking in Pub/Club carparks overnight and the Glenview club is not one of these. 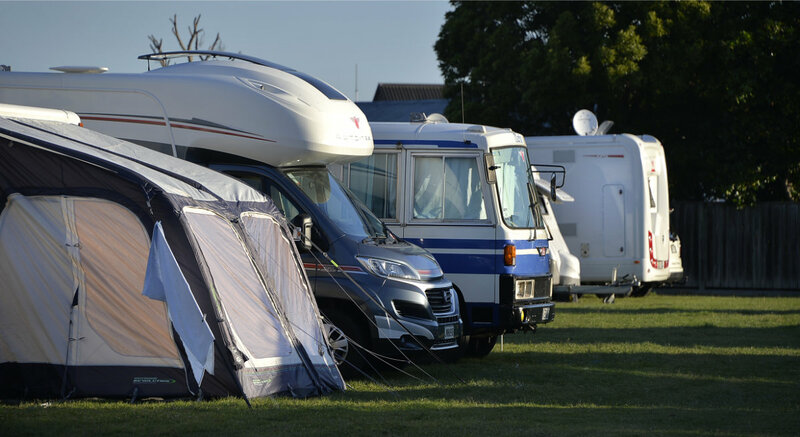 I has a completely separate Motorhome and Caravan parking area away from the main carpark for bar patrons. There are 38 parks without power and another 12 parks with power all on well drained grass. There is an honesty box but they’re there almost every day after 2pm. Its $15 a night without power and $20 a night with power. There is a shower and Toilets and there are meals later in the week during the evenings. There is also fresh water, a dump station with rubbish and recycling. On a week day before a big show it was really busy. Its amazingly quiet and in a great spot right on the Waikato river opposite the Hamilton Gardens. 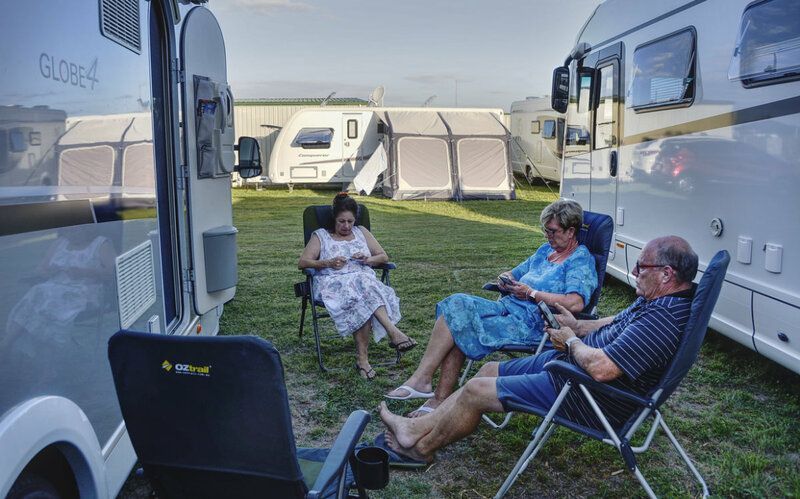 I met several people in Caravans who had sold homes locally and were staying there due to work or to be close to family so there are quite a few who almost reside there longterm. A really nice location, friendly hosts and a really quiet spot to stay. A Park with a view. 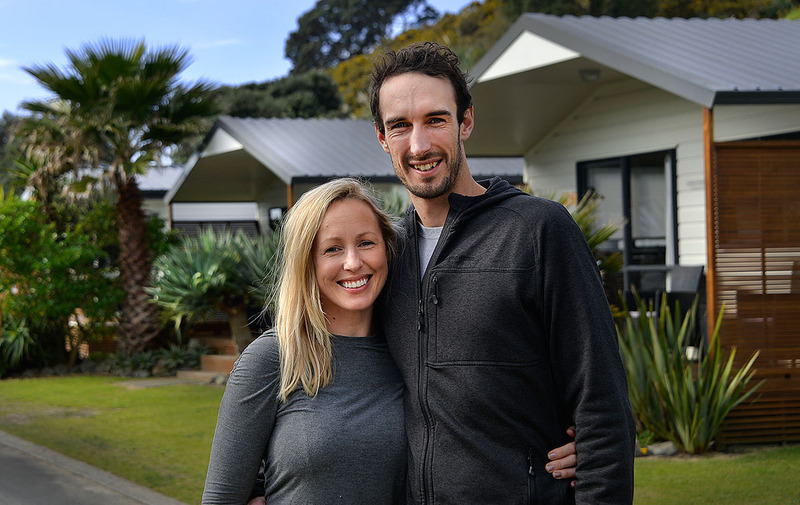 Kevin and Melissa Wallace escaped from Auckland about 15 years ago and bought their piece of paradise in Port Albert not long after. 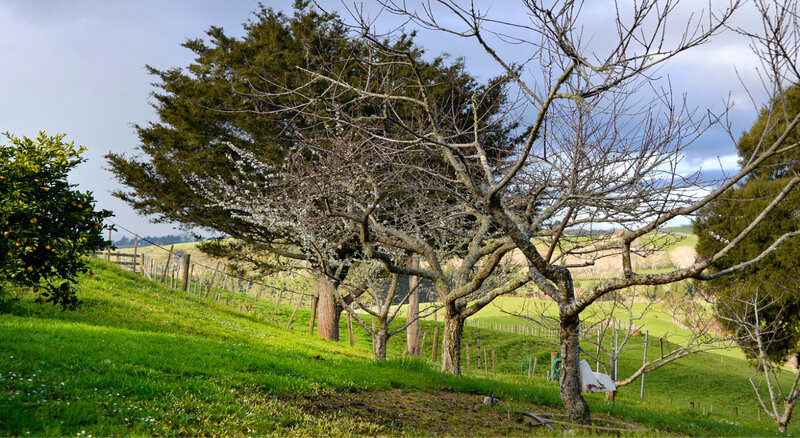 The house along with a huge orchard sit on the top of a ridge overlooking the back of Port Albert and there’s a peek of the Kaipara too. 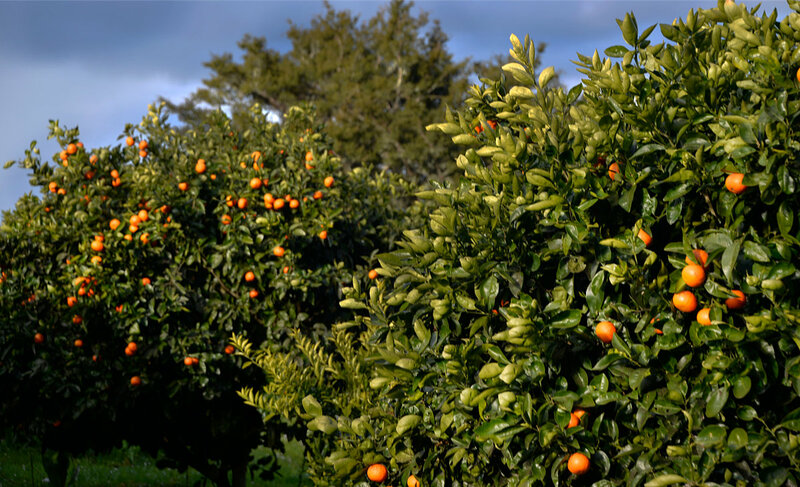 Fiona and I arrived in Rafe and keen to check it all out, were there when Kevin popped in and was very happy to show us around and we were invited to check out the orchard on the other side of the house. After plugging Rafe in and opening some vents, I went for a wander to see what was what. There is a fantastic shower with a loo, a dump station and UV treated water. It was all there. We had a great night there and all for $20 for us both. In the morning, Kevin popped in with some Avocados and a Lemon which was great. 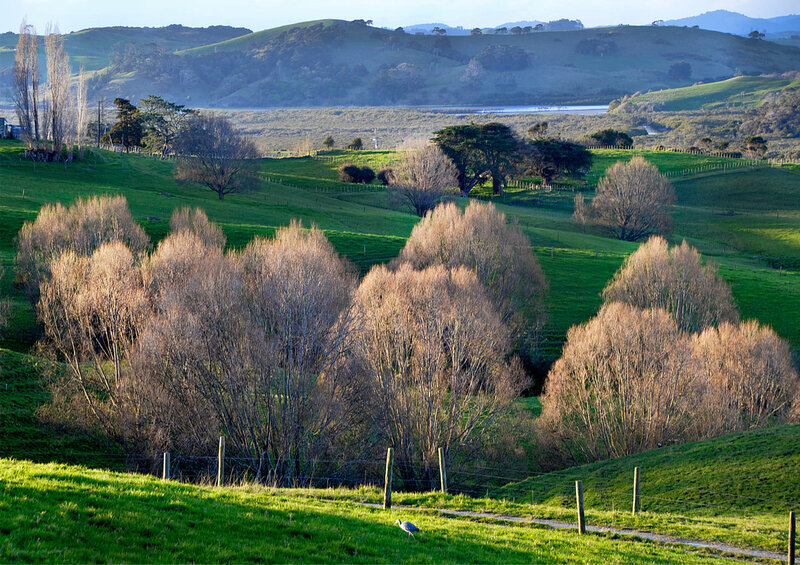 Fantastic hosts sharing their lovely place by the Kaipara. 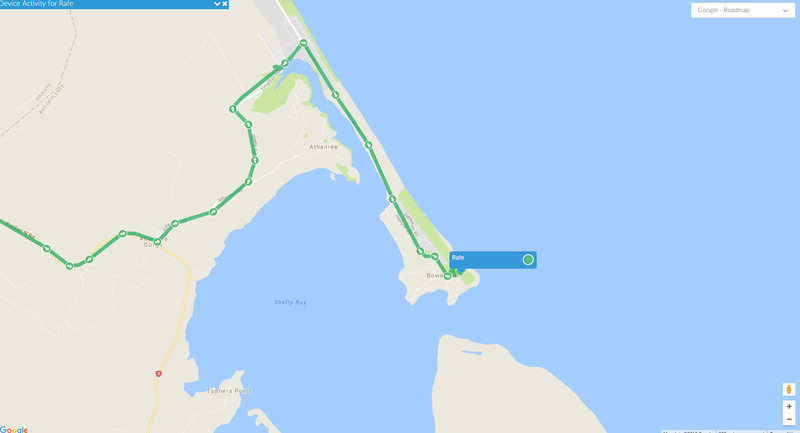 If you’re heading to Port Albert and go about 4k’s past the turnoff, you’ll find it on your left or on the App. This has to be one the best Parking spots that I’ve found and I pretty much found it by accident. The iconic shape of the VW Combi and the bright colours were hard to miss. 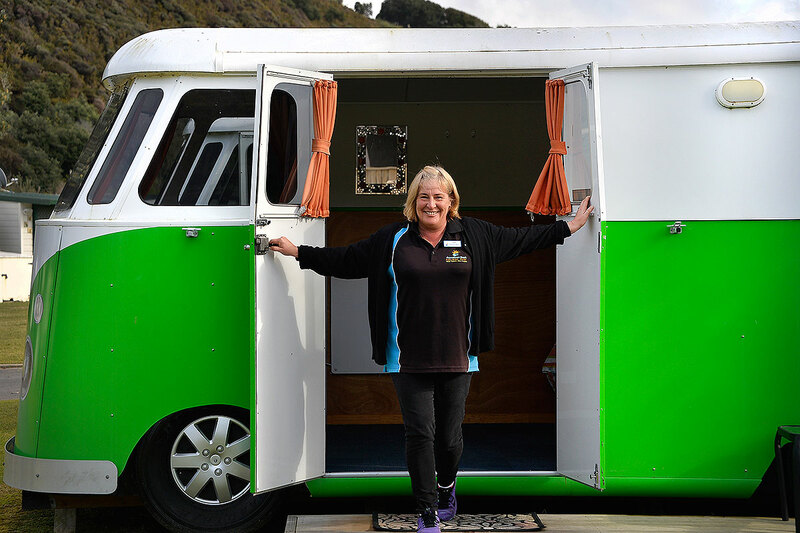 The happy voice of Bowentown Holiday Park, Tania was only to pleased to show me through the amazing Combi cabins. With the bright Green and Orange exterior paintjob they almost glow in the dark! What can you say ! 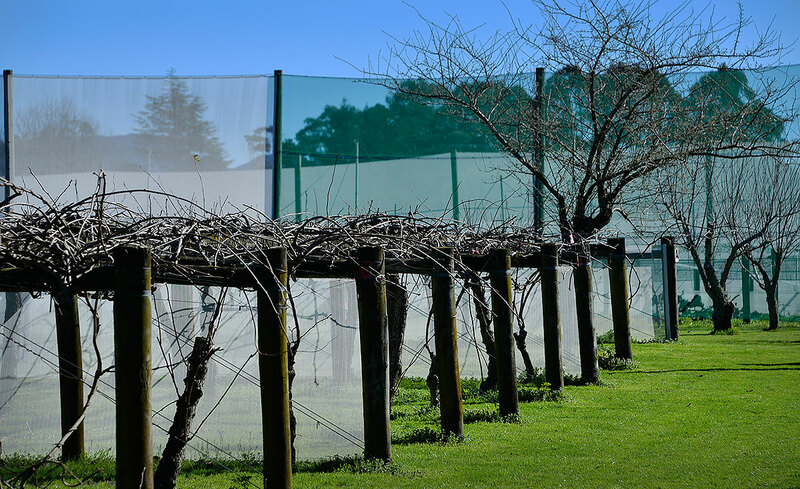 They’re about 4 years old and were originally made in Auckland and are fully insulated, complete with heating and set up very comfortably. New owners of the Park, Mike and Bec are planning to plant some gardens around them and restore the colours to that of the original VW’s. 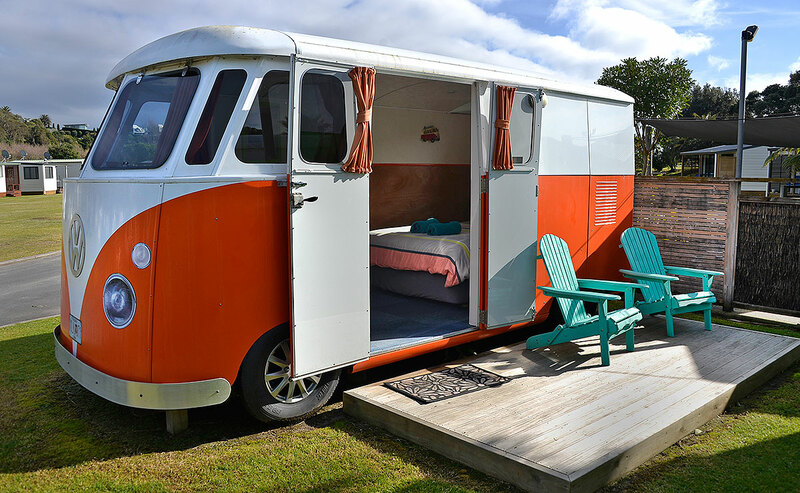 For those who want to stay with Motorhome or Caravan friends, this is the next best thing and in the off season, they’re just $85 a night. A great sight to see and a fun way to spend the weekend away!